Before start, i need to tell you who read this post. 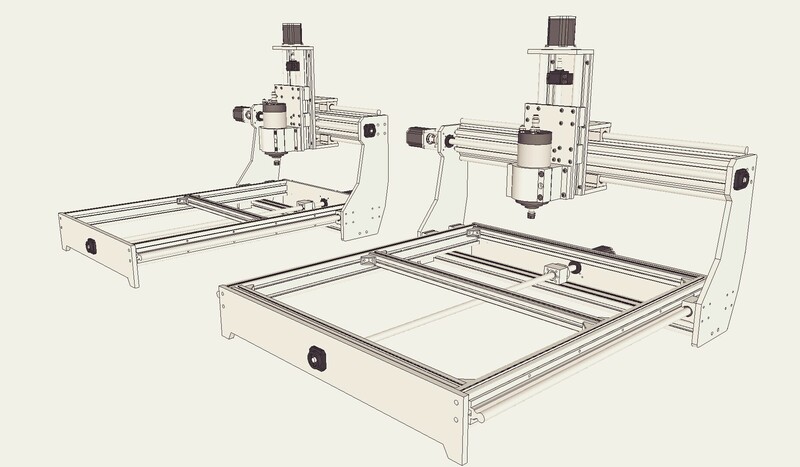 I never build a CNC machine before or know about engineer , electronic , mechanics , etc. But i decide to build my own one. And i have a lot of limitation , never see real CNC before , no milling machine , limit working area and my English is not good (actually it quite bad) and more..
Now i write everything in my Blog and it look like it possible to make it done , so i think it will be an advantage for someone , that why i start to post it here. Any comments or advise are welcome. 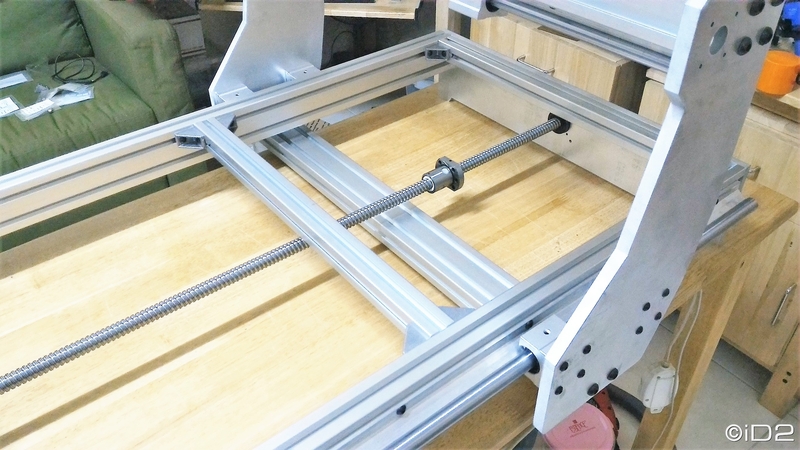 – work with limit working area 40x60cm under my table , but i don’t have table right now i’ll purchase it after i finish my CNC design. แล้วควรเลือกใช้แบบไหนดี ถ้าเลือกได้แนะนำให้เลือกใช้งานแบบ Bipolar parallel แต่เนื่องจากในท้องตลาดบ้านเราหายาก จากที่เห็นมีขายกันในบ้านเราส่วนใหญ่จะเป็นของ Sanyo denki (StepSyn) ซึ่งรุ่นที่มีขาย จะเป็นรุ่นที่สามารถต่อได้ทั้งแบบ Unipolar และ Bipolar (series) ผมเลือกใช้ตัว StepSyn ที่หาง่ายในบ้านเรา และก็เลือกที่จะต่อใช้งานแบบ Bipolar (series) ซึ่งการเลือกต่อใช้งานในลักษณะไหนนั้น จะเป็นตัวกำหนดในการหา Step motor driver มาใช้งานด้วย ซึ่งสำคัญมาก ถ้าเลือกผิดแล้วต่อใช้งานไม่ถูกต้องกับ Driver ระวัง Step motor ม้นจะไม่หมุน และอาจจะเสียเงินเพิ่มอีกรอบ !!! หลังจากมีความรู้เรื่อง Step motor กันไปบ้างแล้วนั้น ระหว่างที่ศึกษาข้อมูลเพิ่มเติม ก็ทำอย่างอื่นไปด้วย นั้นคือ การออกแบบตัวเครื่อง โครงสร้าง และชิ้นส่วนต่างๆ ที่ต้องใช้ ซึ่งการออกแบบนั้นจะออกแบบจากโปรแกรม 3d เพื่อให้เห็นองค์ประกอบทั้งหมด แต่พอคิดจะเริ่มก็เจอปัญหาเลย เพราะใช้งานโปรแกรมพวก 3d ไม่เป็น อีกอย่างไม่รู้จะเริ่มจากโปรแกรมตัวไหนดี ………..? ? ? ? ? ? ? ? ใครอยากรู้ติดตามดีๆ รับรองหายสงสัยกันแน่นอน อยากรู้ไหมล่ะ : ) ถ้ารู้แล้วรับรองจะเลือก Step motor , Step motor drivers ไม่ผิดอีกเลย ไม่ต้องเผื่อเหลือเผื่อขาด จับคู่กันได้เหมาะสม และสบายกระเป๋าด้วย (ไม่ต้องซื้อทิ้ง ซื้อขว้าง) และเดี๋ยวจะมีรูปอธิบายด้วย มือใหม่อ่านดีๆ (ผมก็มือใหม่นี้หว่า จะเชื่อถือได้ไหมเนี้ย) …………..
ดูกันชัดๆ จากรูปด้านบน จะเห็นว่าน๊อตกับตำแหน่งรูเกลียวของ T-Nut ไม่ตรงกัน เนื่องจาก T-Nut ที่รอยเข้าไปในรองของ Aluminium profile กับ Bracket ตำแหน่งรูไม่ตรงกัน 100% เอ๋….แล้วทำไมผมเอา Bracket สำหรับ profile 45mm มาใช้ล่ะ ก็เพราะของจริงไม่เคยเห็น แต่ตัวนี้มีรูปของจริงและขนาด dimension อธิบายไว้หมด ก็เลยคิดจะใช้ตัวนี้ แต่แล้วปัญหาก็เกิด !!!!! 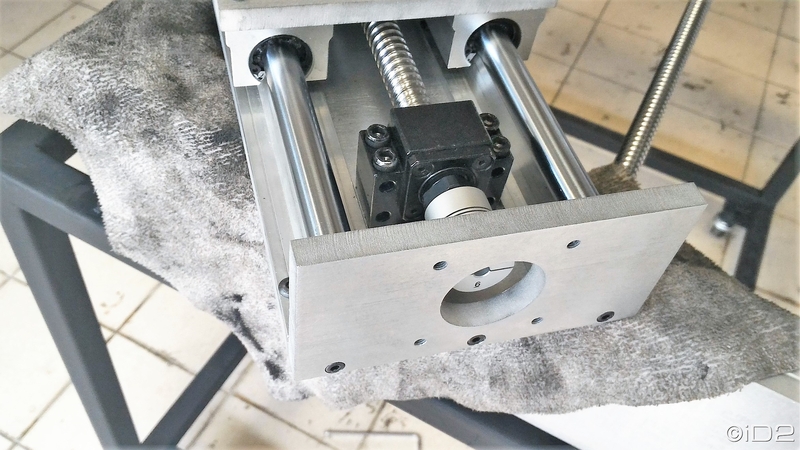 Just finish my Design , but still not complete in every detail such as spindle clamp , spindle , table top etc. I’ll build my machine with the same my design and all parts that i need to purchase , drill size , taps size everything done. Next step i need to purchase aluminium sheet , aluminium profile , t-nut ,bolt , die cast bracket and more. After try to drill 26mm hole ,Haha…Have a problem with sound it so round ,need to keep silence because i work in my room (actually bed room) and it close to other room that sound is my big problem 0_o” . Other problem is my time i don’t have much time ,just only after finished my routine work for a couple hours to do my CNC and picture below you’ll see all my aluminium profile and other and some drill progress. 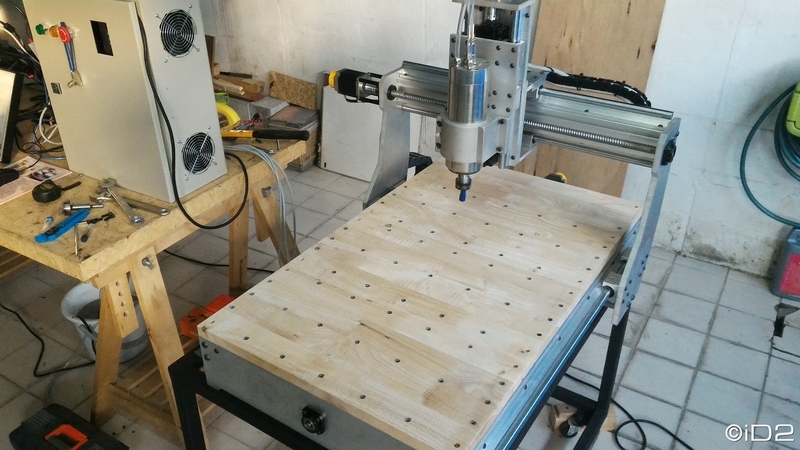 After used my holiday with my CNC project , try to drill a hole and keep it silence but not easy. If you have a shop or anywhere that you can do it with round sound it should be finish in a few hours but i used all day working on it , see picture below what i’m done. Haha..One thing for anyone who concern about accuracy and precision ,i can told you it can make a hole accuracy and precision by drilling it from cheap power drill but it not 100% but it not error more than 0.2-0.3mm that it acceptable. More pictures update of X axis and Y axis. And i need more space to do my work, after look around in my room and i see my bookshelf , i decide to used it as my working area too. See in picture below. More update with first time assembly to check every holes and position to make sure it fit and after finished all assembly i’ll disassembly it again. OK , A little update on my Z axis and still working on it. Don’t have much detail to describe because every holes , tap , and every detail you already see it in my design before. Let’s see what it look like when i make it from sketch. Some item just arrived , Water proof E-Stop button and spindle clamp and limit switch but photo of limit switch is bad. And i’m disappoint in spindle clamp it look low quality , so i will make it looking better. More update , OK just done my … what is that call ? Haha..let’s see picture. Oh..i just know what i’m missing , i fogot to link my parts spec that i design to show you what i’m doing. Um..it fit , OK let’s make it done. Update after assembly motor and z axis. 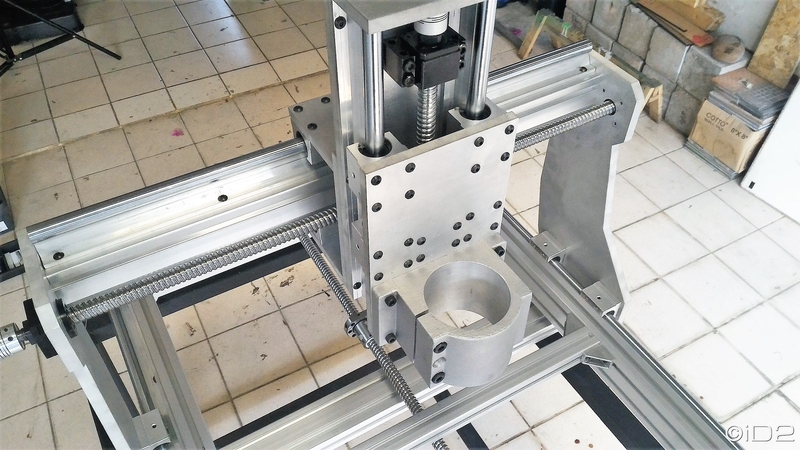 Disassembly Y , Z axis and working on it again , it not finish and need to facing all aluminium to make it looking better but not much. I need to done my Z axis again and move stepper motor position of Y axis. All my Z axis components , you’ll see in pictures below. A little update and not much update for a few day sorry for that , just still busy and need some rest. More update after finished blush aluminium but still have scratch on it and edit some part to make it convenient when assembly you’ll see in picture below. Update a part that use to hold the Z axis , after blush and counter sink . You’ll see in pictures below. After waiting for 1.5kw water cooled spindle it just arrive and it make me confuse about setup and wiring , one thing that it not clear about spindle is ground wiring i can’t find any good guide. Before go to work with wiring i need to do something to hold the cable drag chain but i didn’t design my machine for attach the cable drag chain , so after look around i found some angle aluminium ,aluminium sheet and i don’t want to disassembly my machine to drill some hole for attach the thing that hold the cable drag chain. After think and design them for couple days here it my final decision. OK,Let’s go to work. After bought some wire now i need to start wiring and make that wire in orderly but it still not finish yet because i need to finish all wiring and limit switch wiring too , about limit switch i’ll update in next post and one question about limit switch wiring. What type of limit switch that i need to choose between parallel or series or hybrid ?. OK, Now i already setup limit switch and wiring them but it not finish yet , just finish only X axis and Y Axis. And one problem that i found it look like my X axis was not equal between font distance and end distance , so i measure it again and it not equal around 0.5 ~ 0.7mm . I decide to disassembly it again. OK, Let’s go to work again , all my limit switch are done. Let’s see pictures. First i decide to use 15mm plywood for my table top but i think it not good enough , so now time to burn out my money again i decide to use aluminium profile for my table top. Update my table top ,now it finish let’s see. 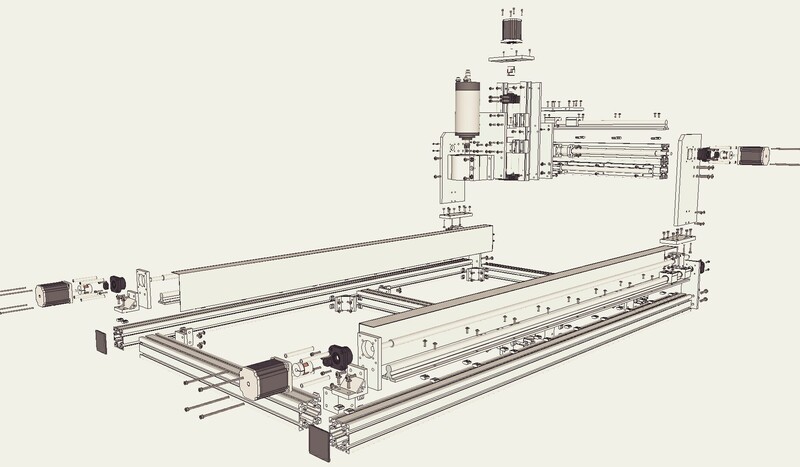 All everything look nice but after try to drawing line with max working area of this machine , it look like machine table top is not equal the drawing line is not continue and after measure table top , the different between left and right is about 0.5~0.7mm. Need to adjust it. Note :: Please look at Yellow line and Red line , If red line is measure line and yellow line is my table top , “It not equal” what it look like see picture. OK, After try to adjust my table top about 0.7mm. I’m try to adjust right side of table top but not much to do with it if i press right side down about 0.7mm that will make my table top will better surface but my linear position was change too , so that mean i need to dissembly it to move linear back to the same position it not a good choice for me. I look back to my Google sketchup design and my note , i got the solution for it and this solution i already design for it but this solution is not much detail in my note, just only note that it will be happen and i can use …. (what word for “no accuracy of cheap power drill”) to adjust it. OK let’s see detail how?. 1st, try to adjust right side of table top. It still not equal but 0.2mm it acceptable. Sorry for description in pictures if it not clear , try to use easy words i’m not good in English. For a week with nothing update still busy with my work ,what next. OK i need to build a cabinet to cover my machine to protect sound and dust when machine running and after bought 1st aqua pump and it can not pump over 1.2m , so i just bought new one. let’s see pictures. Hello, sorry for disappear for long time i’m still busy. OK let’s see my cabinet (not finish yet) and not much that i can do by using my sleep time. Hello 1,2,3 week not much update and look like my routine work will busy for a couple month but i’m try to finish my personal work too. OK before i mill something like wood ,soft plastic , acrylic , MDF (this is a big problem when i want to work with this because it make a lot of dust and Yeah!!! my machine in my bedroom too) so i need to do something to collect dust , after research i found this “DIY Cyclone Dust Collector” that it good guide and it awesome but if i do that it will need some tool that i don’t have it so let’s think how to make it easy and cheap ?. After no time to design i decide to go to home store to find something to make that and yeah i got it. After work with white one (don’t know what it call in English) but it not work for me, so look around in my room i found plywood so i decide to use it for replace the white plastic but need to cutting it cycle but not easy to do it by hand tool , OK i have CNC Machine Haa.. why don’t use it. OK, Finish cutting but not good result i burn wood that mean i not correct spindle rpm and cutting feed rate but it ok i’ll find best spindle speed and cutting feed rate next time. Let’s see. This first test to use it and it work but still have a problem with vacuum it so noisy if i use it for couple hour maybe my neighbor (other room that close to me) will kill me, i need to make it silent but how????. Today i have a little time to do engraving Zero Plate for Auto tool Zero and i need to try some engraving but i did’t have engraving bit or 1mm endmill , So look around my power drill i saw broken drill bit with 2mm and it not sharp , OK did’t have another one then use it. I design from Google Sketchup and export to dxf and import to CamBam to generate G-Code. I take some video and picture below. Continues with auto tool zero , now i already finish my auto tool zero and take some video to show you. After finished auto tool zero and it work but how to make it work. Let’s see detail of Mach3 Config. This forums at CNCZone you need to check. Thank you for all of them who write and shares it. When click Opertor–>Edit button script , all of color box (yellow , red box) will flashing then press “Auto tool zero”. The script dialog will popup and you need to put you script here. for script see link above. Note :: It’s was easy and make it work by specify you plate thickness at this line of code. What’s next i will do in the weekend? Now i start design my Dust Shoe for my CNC ,it not much detail for now and i’m still working on it and after finish my first dust shoe i’ll sell my dust shoe for locally only (just for now). This not industry dust shoe but will cheap and usable for hobby CNC , i think it will finish in this weekend (not much time to working on it) see my first design below. The brush footer it not good enough , I need to redesign about it again. Hello , Now it time to design my enclosure. First i need to drawing some electronic components to use it for design layout and measure dimension of my enclosure and i’ll using aluminium profile 2x2cm for build my own enclosure. See my drawing below. OK back to work, This’s my design and it will be somethihng like this but it still not complete yet. Time to start build my CNPC (CNC + PC) ,just have little time to cut acrylic and aluminium profile but still have many thing to do. Not much description but a lot of pictures. A little update with DB25 breakout board mounting. Today i just go to shopping ,so not much thing i can finish, a little update. Back to my work, try to test assembly case to prove that everything fit together but still need to drill and tap top panel and right panel i think i’ll finish top and right panel soon. Just finish cutting right panel and finish drill ,taps top panel and next step i’ll do spray paint. Update finish right and top panel, and start assembly. one of my problem when assembly this case that 4pin PC PSU is to short , i need to extend 4pin wire to connect to motherboard. OK, Start to wiring and put some stuff to case. This my next job to use this resistor to reduce 12v to 8v , to make fan quiet. Actually i need to use PC Fan Control it can adjust voltage but it expensive so i decide to invest with this resistor it very cheap. Back to work !!!. For a couple week ago i don’t have time to work with my Case and don’t have time to rest too , busy busy and busy. So today i have 4 hour to rest before back to my routine work again this a little update , i just finish my Case handle. 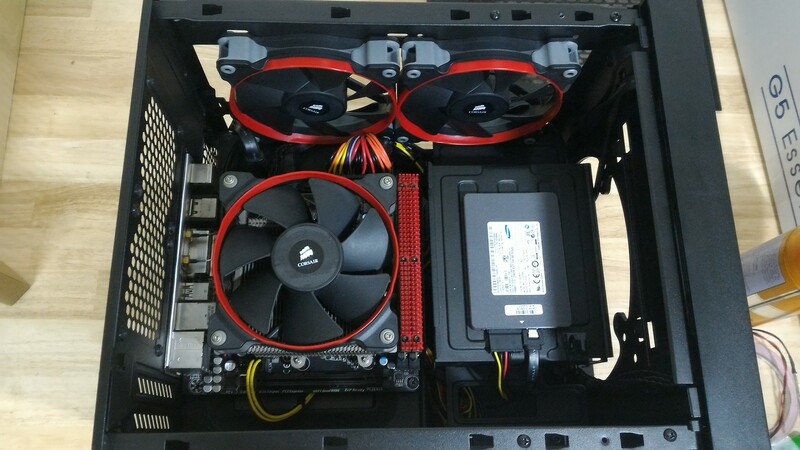 Just done new foot base of my case and after waiting for RMA part and it still not in progress , so i decide to sell my other part that still working and bought new one. A little custom mod of my new motherboard to add heatsink to chip. See picture below. Again, Black to work just add led light to my case , not much better design just need the light. And now just finish 8 fan setup and it quiet by using huge resistor. Just put Spindle inverter to my Case and it will close to finish soon , Still need to custom font panel both left and right. Hello, Long time nothing update agian, so now just finish my right font side panel. Not much description let’s see picture. Do you have a set of plans for this CPU/CNC control case? 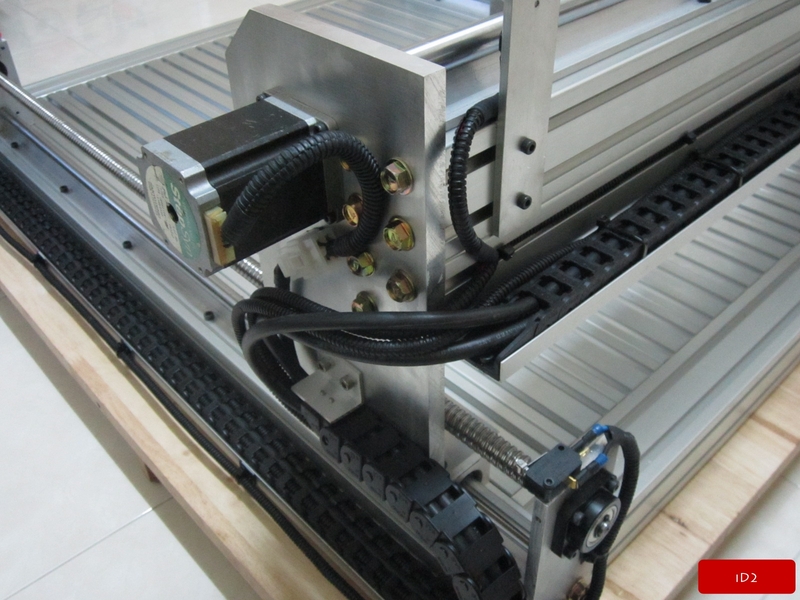 I’m sorry the control case plan that use for my old cnc it was lost with my damage HDD but i have plan to create the new plan of cnc control case for sale soon.